This lemon ointment cake, complement an elegant party or perhaps a weekend treat, is as tasty since it is pretty. I don’t reach make cakes normally as I might like. As an adolescent, I would personally have great fun generating gathering desserts for, really, any occasion at hand: my parents’ anniversary, my brother’s birthday, or for no reason after all apart from to own a great time. Cupcakes, however, I make on a rather regular basis. They’re convenient, and I have significantly more control of the group dimensions – I’ve made a 3 cupcake batch before to satisfy my craving. Additionally they travel effectively when you have one of those convenient little cupcake providers, which obviously, i actually do. But sometimes… sometimes you merely wish a dessert fit for a party. 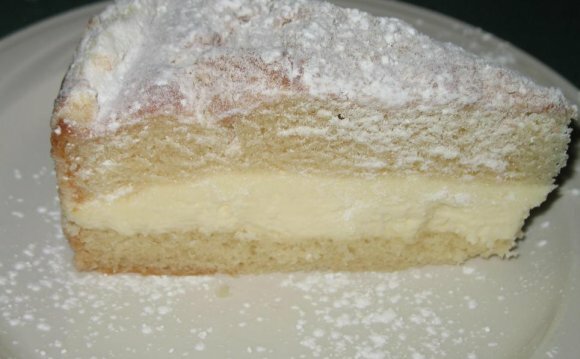 I’ve loved lemon cream cake since my mother introduced me to it at a women’ lunch we'd a couple years back. She downright adores this cake, and we also usually purchase it once the two people have actually lunch at an Italian restaurant (unfortunately, my dad just isn't a fan of either Italian food or lemon any such thing). Since I would be seeing my mom shortly, it seemed like the full time to determine a way to replicate this cake. We dug-out my go-to dish for lemon curd from Sherry Yard. She adds a tiny bit of lime juice to provide the curd a higher level of taste, an addition i truly enjoy. But truly, using this dessert, the lemon lotion filling is the star. I enjoy lemon desserts, as evidenced because of the many lemon meals I’ve published by myself blog. Unfortunately, I Am Able To just handle pure lemon curd in small amounts, but when tempered with cream-cheese and whipped cream – WOW. It offers the ideal number of creaminess, the taste is spot-on, and I could appreciate it alone for dessert. You know, my mom’s birthday is originating up in some months…i simply might have to make this dessert once more. 1. Fill a medium saucepan 3/4 of this means full with cool water as well as heat over medium heat. Make an ice shower (ice and chilled water) with a medium-sized dish, set aside. 2. Zest the lemons and combine the zest and sugar in the food processor and blitz for about a moment to make lemon sugar. 3. Juice the lemons and limes, put aside. 4. In a big heatproof glass bowl, combine the lemon sugar, eggs, and egg yolks, and whisk for about 30 seconds. Place bowl over simmering water until sugar melts (scrub a little egg combination between your thumb and finger – the sugar features dissolved with regards to no further seems gritty). Pour in lemon/lime juice. Whisk until curd is the consistency of sour lotion and achieves 160 F. eliminate from temperature and start whisking in the butter, one piece at a time, until included. Pour the curd through a sieve to remove any gusto or lumps. Destination dish in ice bath and place sheet of synthetic wrap entirely on the top of curd to cool rapidly and avoid a skin from forming in the curd. 5. The curd can be refrigerated up to per week beforehand. 1. Sift flour, cornstarch, baking powder, and sodium in medium bowl. 2. Whisk egg whites, buttermilk, and vanilla in big measuring cup. 3. With a stand mixer fitted with paddle attachment, blend sugar and lemon gusto on reasonable to discharge the zest’s oils. Add butter and cream on medium speed until light and fluffy, about 4-5 mins. 4. Lower rate to low. Include flour and milk in 3 batches, starting and closing using the flour. Increase speed to medium high for a moment to add even more atmosphere. 5. Divide batter between two 9-inch round baking pans lined with parchment. Bake 30-35 mins at 350*F or until an inserted cake tester arrives clean. Cool for five full minutes, after that remove from pans, remove parchment, and cool entirely on line racks (right-side up). 1. Bring sugar and liquid to a boil, stirring until sugar has mixed. Pull from heat and blend in lemon juice. Cool. 1. Beat cream cheese and sugar until well-blended. Combine in lemon curd on low speed. 2. Whip cream to stiff peaks. Fold cream into lemon combination yourself. Refrigerate. 1. In a method dish, mix flour, sugar, butter, and vanilla with fingers until clumps form. Separate clumps into small crumbs.